Infinity Foods is an independent supermarket situated in the North Laine area of Brighton. 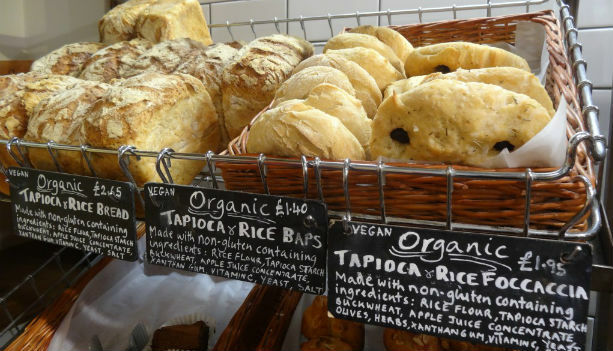 It sells a huge range of Gluten Free and Dairy Free products; you name it they’ll have it. They’ll even have Gluten Free products you have never seen before. My favourite part of Infinity Foods however, is their on-site organic bakery. All the bread sold in the Infinity Foods Bakery (towards the back of the shop) is handmade & freshly baked daily by a very small team. The gluten free options are amazing. I am a huge fan of their freshly cooked gluten free pizza slices (they always have pizza that is both gluten free & dairy free/vegan). I also love the gluten free loaves, rolls (simply the best ever) & foccacia breads that are handmade every day. If you are visiting Brighton & think there is no need to visit a supermarket whilst you are there… I beg to differ. You must visit the Infinity Foods shop. Oh, & they also have a Infinity Foods Cafe just down the road too! 2. The Creperie, 2 Ship Street, Brighton, BN1 1AD. I’ve been wanting to visit The Creperie ever since it first opened last pancake day. I can’t believe it has taken me so long to get here. Situated very close to the sea front, this is a real gem in Brighton. So, The Creperie is all about pancakes/crepes/galettes.. whatever you call them! 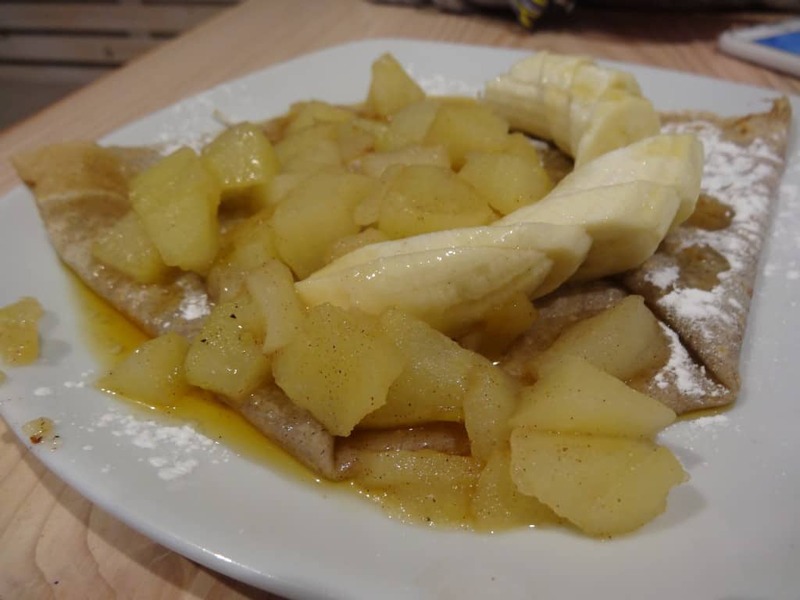 The Creperie serves Gluten Free & Dairy Free Galettes (essentially a pancake made of buckwheat flour) with a huge range of sweet & savoury fillings. You can takeaway & sit on the sunny beach or eat in… I would recommend eating in, they have an amazing contemporary interior that makes you want to redesign your home! The Creperie is open for Breakfast, Lunch, Snacks & Dinner… you should probably visit for every meal, I love it. Oh, & you can hire it out for Adult or Children’s Birthday Parties too, a Gluten Free Pancake Party? Yes please! 3. Little Bird, 16 Kensington Gardens, Brighton, BN1 4AL. 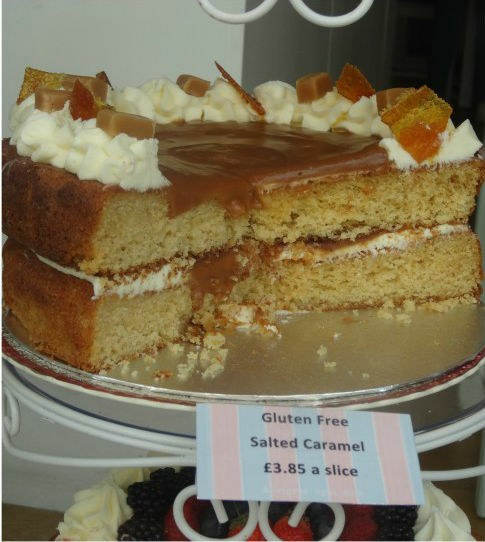 You are never short of places to eat freshly baked gluten free cake in Brighton. Little Bird is one of my favourites for this. It’s a small cafe in the heart of North Laine & it rocks! If you manage to get a table inside, you will definitely become the envy of all the people walking past, gawping in the window at the delicious cakes! I always go for their delicious gluten free chocolate, banana & pineapple cake. I would definitely recommend it! There are also dairy free & vegan cake options here… the banana & passionfruit dairy free cake looked especially nice on my last visit! This is a definite go to place in Brighton, don’t miss out! I did a review of Little Bird a while ago, if you want to check the post out then click here! 4. Cloud 9, 15a Kensington Gardens, Brighton, BN1 4AL. Oh Cloud 9, I love this place… I think I say that about everywhere in Brighton. Cloud 9 actually have two cafes in Brighton. One is literally opposite Little Bird in the North Laine. The other is situated in The Lanes area, both sell equally delicious cakes! (Though, for the delicious ice creams, head to The Lanes Cloud 9!) Every time I am in Brighton I will always grab something Gluten Free to take away. My absolute favourite is the Gluten Free Cheesecake Brownie. 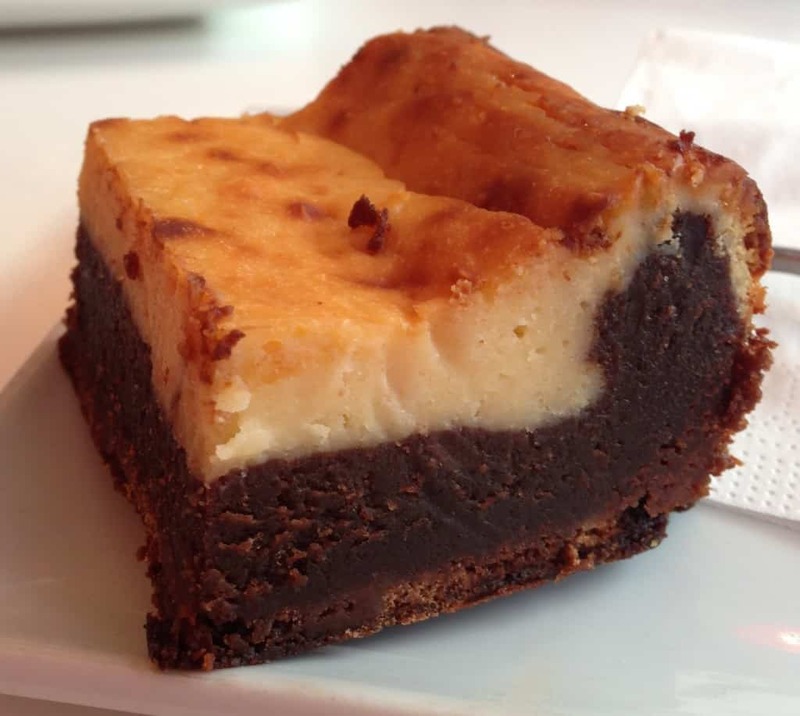 Not only do I recommend the Cheesecake Brownie, but last year my very cheeky dog stole my Gluten Free Cheesecake Brownie I had brought all the way home & gobbled it up! There is always a great variety of gluten free & dairy free cakes & bakes available. Also, if you are looking for a celebration cake, Cloud 9 will make amazing gluten free cakes… I got this one made last year! Cloud 9 have been reviewed on Gluten Free Cuppa Tea before.. Click here for Part 1.. Click here for Part 2! 5. Pho, 12 Black Lion Street, Brighton, BN1 1ND. Pho is definitely one of my favourite restaurants. The first time I visited was back in 2010 in Brighton & since then I have been back to the Brighton restaurant as well as loads of their London locations a thousand times! 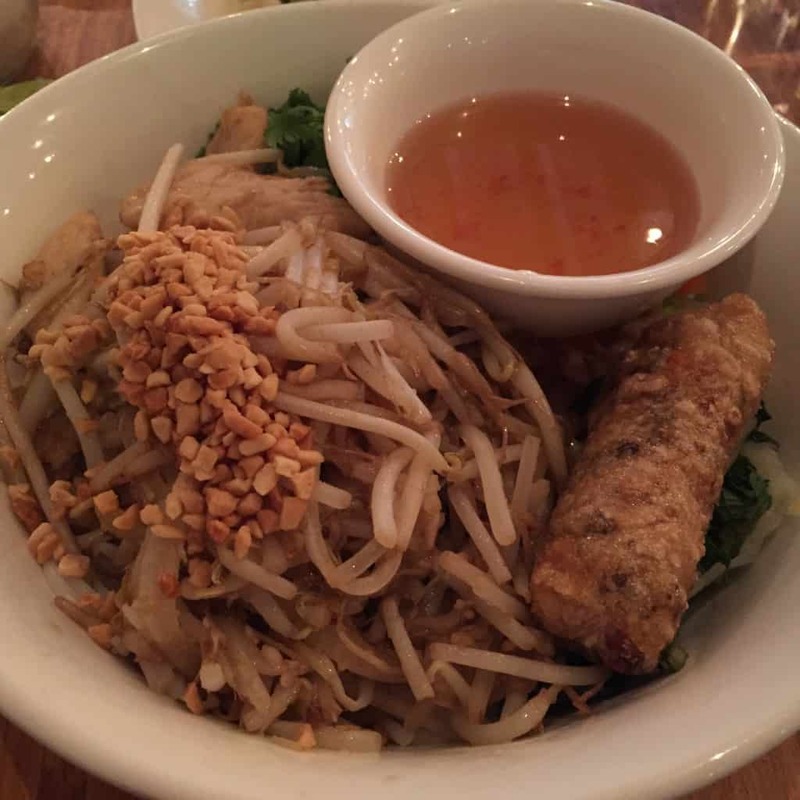 Pho is Vietnamese; a cuisine which is naturally gluten free. Basically the entire menu is gluten free & any thing that isn’t can be made gluten free. In Vietnamese cooking unlike a lot of other Asian cuisines, soy sauce is not one of the number one ingredients. The Noodle Soups are delicious & the Bun Noodle Dishes are insane! The crispy spring rolls are also gluten free, I would definitely recommend trying them. Pho in Brighton is amazing value, in an amazing location & it’s amazing quality. Please go! Here is a past review. 6. Mange Tout, 81 Trafalgar Street, Brighton, BN1 4EB. Mark & I never visit Brighton without a trip to Mange Tout. We very often nearly don’t get to go as you really should book a table… it gets very busy! Mange Tout is a French Bistro open for Breakfast/Brunch & Lunch every single day & Dinner on Thursday/Friday/Saturday. We always go for brunch, & even at 11:30am it is essential that you book, unless you want a lengthy wait. You can tell it’s a Brighton favourite amongst regulars, which is definitely a sign of a good restaurant. 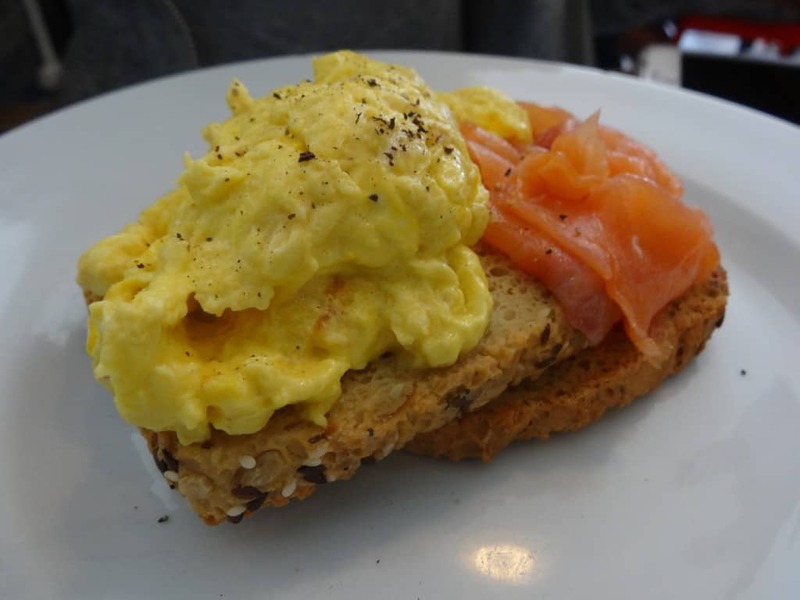 I always go for scrambled eggs & smoked salmon on top of some delicious, freshly baked gluten free bread (toast!). The gluten free bread is out of this world, & everything else is cooked to perfection. This is definitely a top, top tip for any trip to Brighton. 7. Hen, 87-88 Trafalgar Street, Brighton, BN1 4ER. Hen is a fairly new restaurant in Brighton compared to some I have mentioned so far. I have been recommended to visit it a few times now, so I had to check it out. So glad that I did! Hen, as the name suggests calls itself a Chicken Restaurant, but, it is so much more than that. I mean, I didn’t eat any chicken when I visited!! 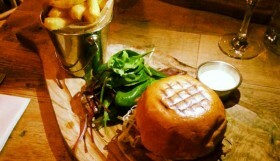 (I must admit Mark went for a Pulled Chicken burger which looked amazing though!) I actually went for Gluten Free Waffles! 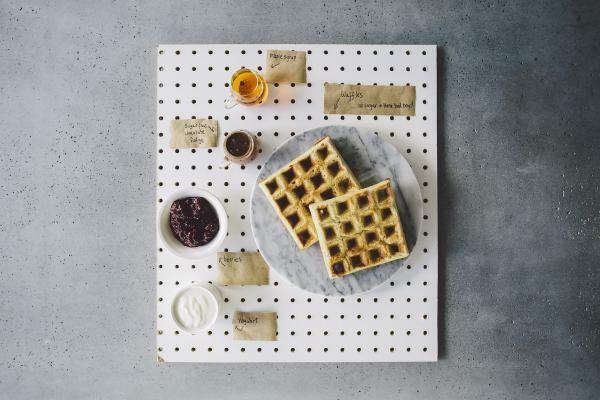 These waffles are not only gluten free, but sugar free too. I had mine with a sugar free chocolate fudge sauce. I want them again, and again.. and again! They also have tasty sounding daily specials, so keep your eyes peeled. Oh, & the interior is awesome.. they are even up for awards for this alone! 8. Boho Gelato, 6 Pool Valley, Brighton, BN1 1NJ. So Boho Gelato is all about ice cream/gelato/sorbet. It’s close to Brighton Seafront & perfect for those on a gluten free diet but better still… its a great place for dairy free. Now, not every single flavour is dairy free, BUT there are dairy free flavours at Boho Gelato that I would never have expected in a million years… & they taste amazing! If you are thinking of going, I would recommend the dairy free (& gluten free!) Peanut Butter Sea Salt Caramel flavour. It is their most popular flavour & for very good reason! 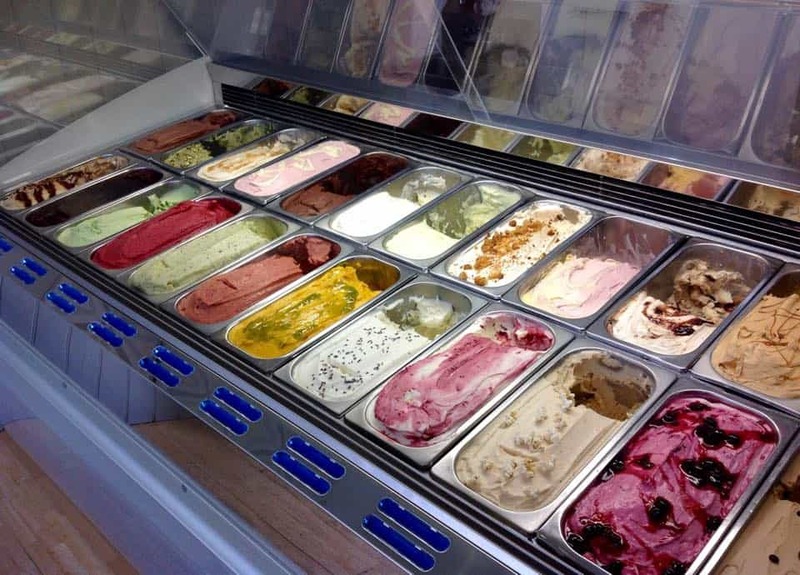 Boho Gelato are always changing their flavours to fit in with the seasons and festive occasions too. You will find flavours you will find nowhere else. It rocks. 9. 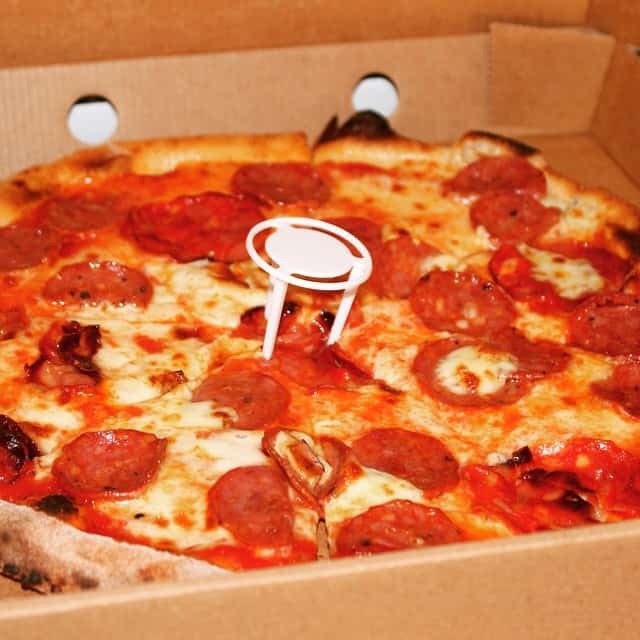 Pizza Face, 35 St Georges Road, Brighton, BN2 1ED. I have heard amazing things about Pizza Face for a very long time now. Gluten Free Bases… Vegan Cheese & a whole host of delicious toppings. I guess I haven’t had a Pizza Face pizza before because it’s all about Takeaway & I never think to order takeaway when I visit places. On this occasion, it was a rainy eve in Brighton & all I wanted was pizza. They deliver all over Brighton & so we got it delivered straight to the apartment. The gluten free bases are amazing, nice and crisp. I had a pizza called the Parma, which had the most delicious Prosciutto on it & large dollops of Mascarpone Cheese.. it was insane. One of the best ever. Mark had vegan cheese on his pizza & again it was one of the best. A place where you can get have pizza gluten free & dairy free is always a top recommendation from me! 10. Foodilic, 163 Western Road, Brighton, BN1 2BB. Another Brighton gem that I would recommend especially at lunch time. Brighton has 2 Foodilics, both very centrally located. 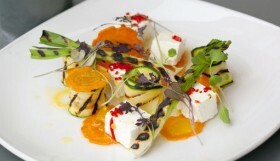 I recently visited the Foodilic on Western Road & was very impressed. It’s an eatery that prides itself on being not only delicious, but also highly nutritious. The gluten free options at Foodilic are great. It’s a place where you can mix & match, they have a selection of mouthwatering foods freshly prepared. You can have some salmon or chicken alongside sweet potato wedges, salads, quinoa. 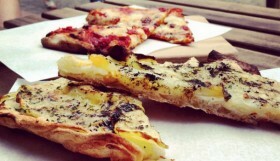 There are gluten free quiches, savoury tarts, even gluten free custard tarts! Oh & the smoothie selection is great too. 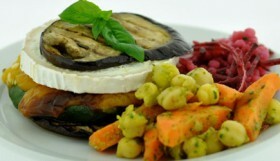 It is also perfect for veggies, vegans & even those considering a raw food lifestyle. There really is something for everyone! 11. Bagelman, 16 Duke Street, Brighton, BN1 1AH. 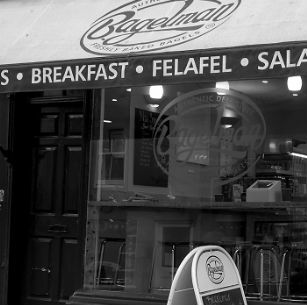 So Bagelman is a longstanding Bagel chain native to Brighton. It now has numerous stores across the city & finally they have jumped on the Gluten Free Bandwagon. Now this is BAGELman so I know I am instantly going to disappoint you when I say they currently don’t provide gluten free bagels. But, what they do provide is as good, if not better. The Gluten Free Rolls they provide, come from the amazing Sussex Bread Company. Get this, the Sussex Bread Company is an entirely gluten free bakery! The choices of fillings at Bagelman is extensive, I went for the ‘Funky Tuna’ – Tuna Mayo, Avocado, Olives & Lemon. Delicious. I would definitely recommend it, & I am sure in the future actual Gluten Free Bagels will be on the menu.. just keep pestering! 12. Wolfies of Hove, 90 Goldstone Villas, Hove, BN3 3RU. So, one of the main questions I always see about eating gluten free in Brighton is… ‘Where can I get Gluten Free Fish & Chips.’ I have always found it extremely surprising that Gluten Free Fish & Chips isn’t more of a thing in this seaside town! However… look no further, Wolfies has got it covered! Gluten Free Fish & Chips are available every single day at Wolfies, they use a completely separate gluten free fryer to guarantee no cross contamination. They also have a really wide range of different fish from Red Snapper to your standard Haddock & Cod. Gluten Free options don’t cost anymore either! 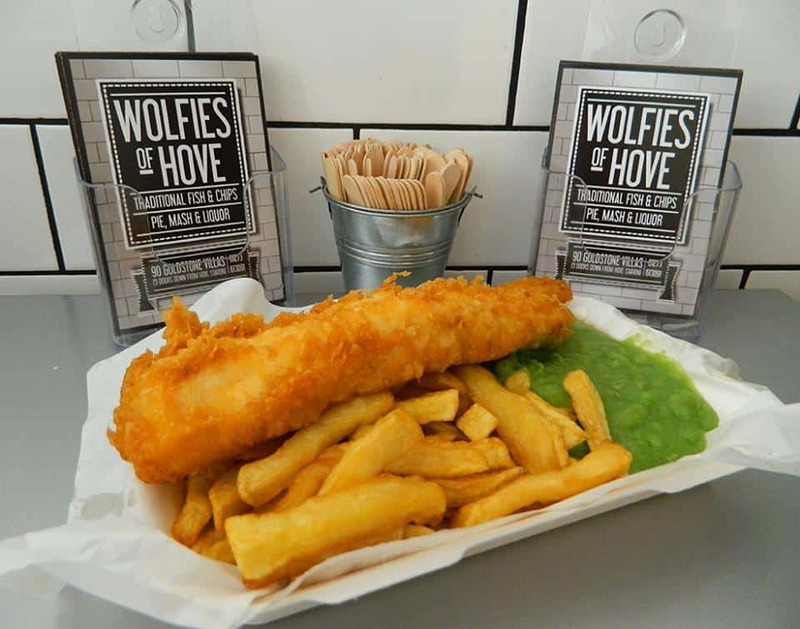 So if you’re looking for quality gluten free fish & chips in Brighton, head to Wolfies of Hove. 13. Morelli Zorelli, 40 Western Road, Hove, BN3 1JD. Another amazing place to get Gluten Free Pizza in Brighton is Morelli Zorelli. Here you can sit in or have a takeaway (delivery is an option). 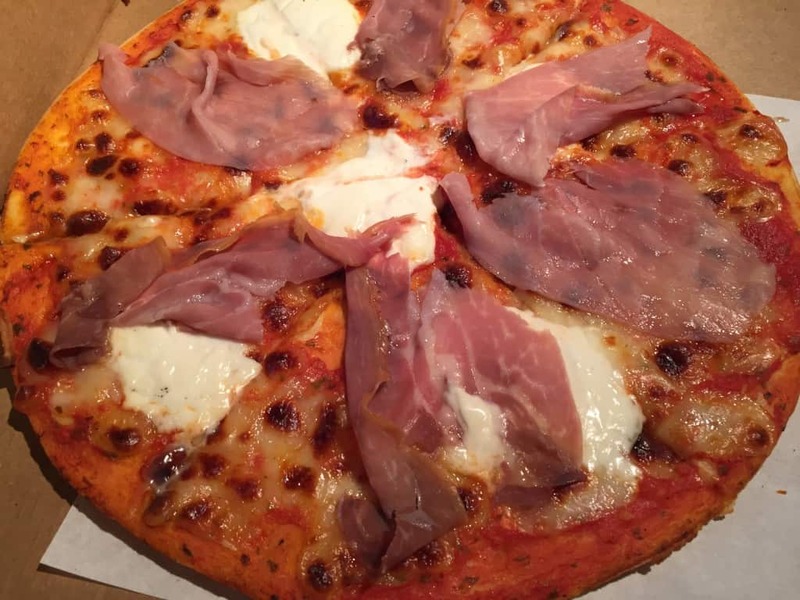 All their gluten free pizzas are made on Venice Bakery UK pizza bases; which, if you have been following me a while you know are one of my favourites! They also have vegan cheese available every day too. The selection of toppings is varied and extensive. I am a huge fan of Ham & Pineapple but the Wild Boar pizza I have heard is amazing too. I can guarantee you won’t be disappointed on a trip to Morelli Zorelli. 14. Glutenwise, Brighton Open Market, Marshalls Row, BN1 4JU. So this post is all about my personal favourite parts of Brighton for Gluten Free. 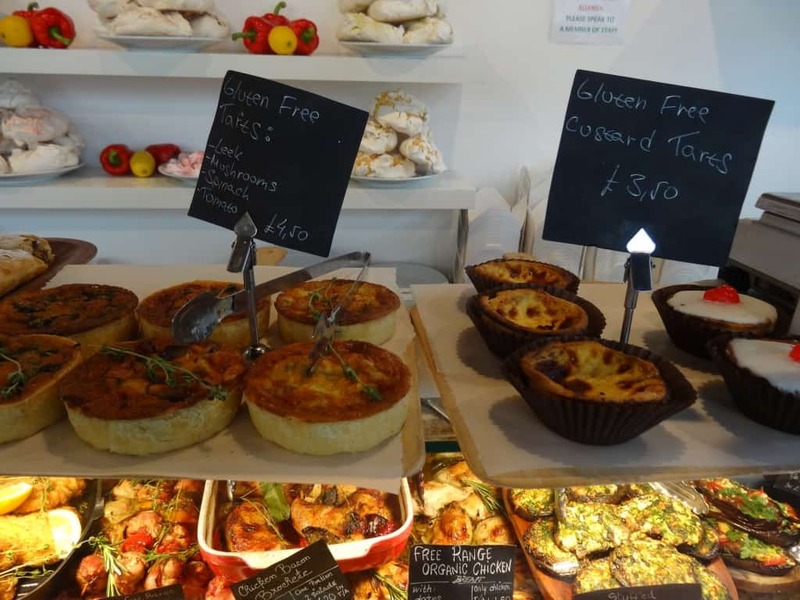 & there is much more to Brighton’s Gluten Free scene than just cafes and restaurants. Glutenwise is in fact a market stall, run by the lovely Zarah every Saturday at the Brighton Open Market. 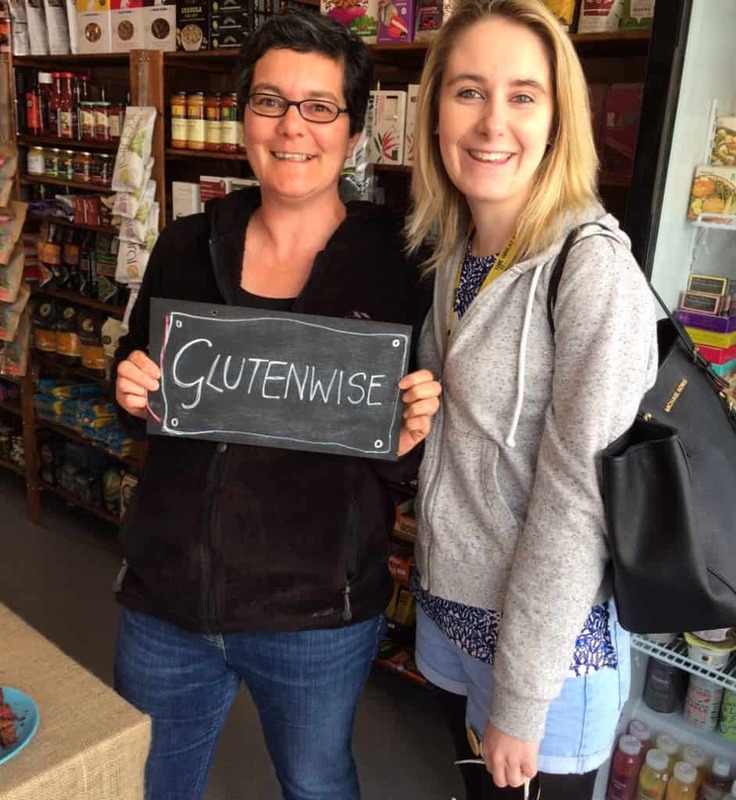 Zarah also takes Glutenwise around Brighton to the various food & farmers markets throughout the year. 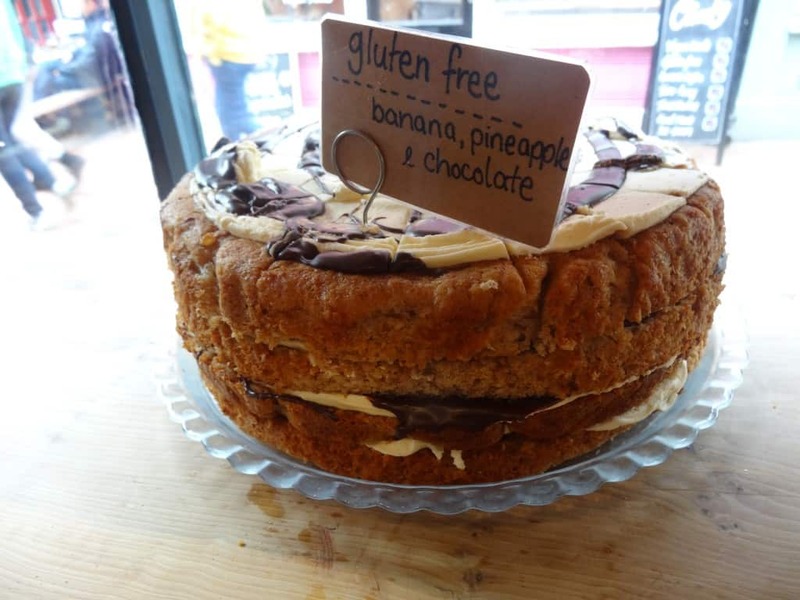 I came across Glutenwise many years ago now & if I am every in Brighton at the weekend I will always pop along for some delicious gluten free cake. From lemon bakewell tarts, loaf cakes & even gluten free battenburg, Zarah is brilliant at making all our classic bakes gluten free. I’d highly recommend visiting Glutenwise at the Brighton Open Market. 15. Catwalk Cakes, 22 Bond Street, Brighton, BN1 1RD. Now I know I mention lots of places to get cake in this post. But, the thing is, I love cake and Brighton seems to love providing Gluten Free Cake options. Catwalk cakes is so exception. It’s the sort of place you will stop and stare at as you walk around North Laine. They have amazing cakes in the window & fortunately, some are gluten free & also, some are dairy free/vegan. I had a delicious Salted Caramel Brownie which had little shards of hard caramel sticking out of the top, it was seriously amazing. Catwalk Cakes is a lovely place to sit in or takeaway. They also create amazing celebration cakes, so if you have an occasion coming up, you might like to consider popping into Catwalk Cakes for some gluten free cake chatter! 16. The Breakfast Club, 16-17 Market Street, Brighton, BN1 1HH. Amazing news for Brighton is that The Breakfast Club is coming to town. I am a huge fan of The Breakfast Club in London & have been for so many years. Well, as of June 2015, The Breakfast Club has another home in the Brighton Lanes! The Breakfast Club has lots and lots of Gluten Free Options & ‘Breakfast’ is served all day! 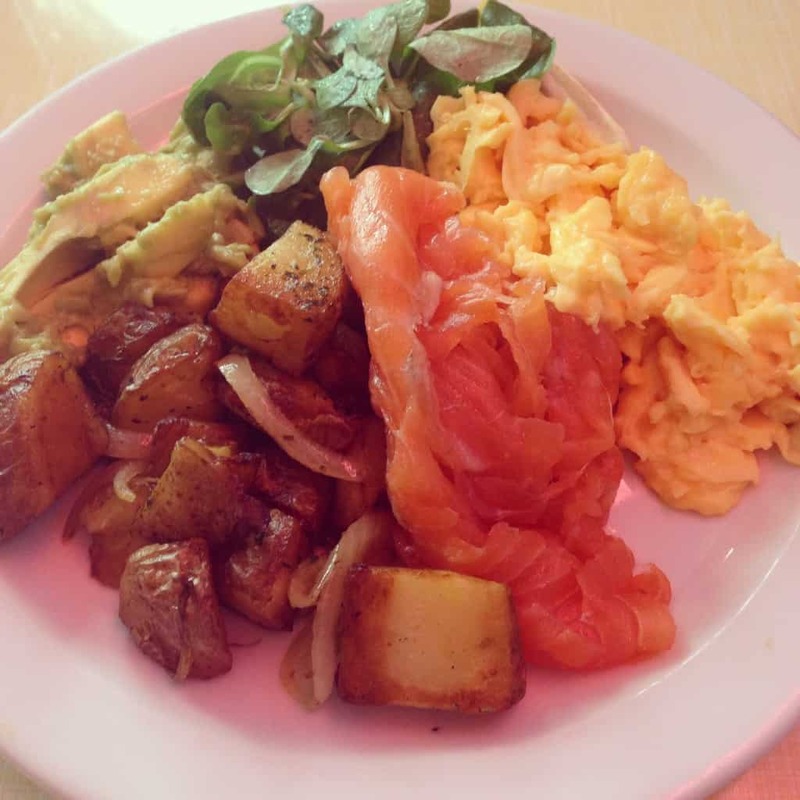 I love having Smoked Salmon & Scrambled Eggs served on Home-Style Fried Potatoes with Mashed Avocado.. it is insane! They don’t just serve breakfast food, lunch & dinner food is available too. What really makes The Breakfast Club is its vibe & style, I love it. A great addition to Brighton, you must go if you haven’t been before!